A, another day, another report linking the devastation of bee populations to dangerous pesticides. And yet Bayer and its chums are still determined to peddle their bee-killing wares. We’ll never have the deep pockets of corporate giants like Bayer. But when we all club together we have the resources we need to fight and to win. A, please can you make a small monthly gift today to save the bees from Bayer? Yes - I’ll chip in to supercharge the campaign to save the bees at this critical time. No thanks, but I'll make a one-time gift. The world’s bees are being catapulted towards extinction - and a NEW report firmly points the finger at multi-billion dollar pesticide giants. SumOfUs is running bee-saving campaigns across the USA, Canada, Europe and Australia. But with this new evidence, we need to step it up a gear. Can you chip in now to power up SumOfUs’ global campaign to save the bees? 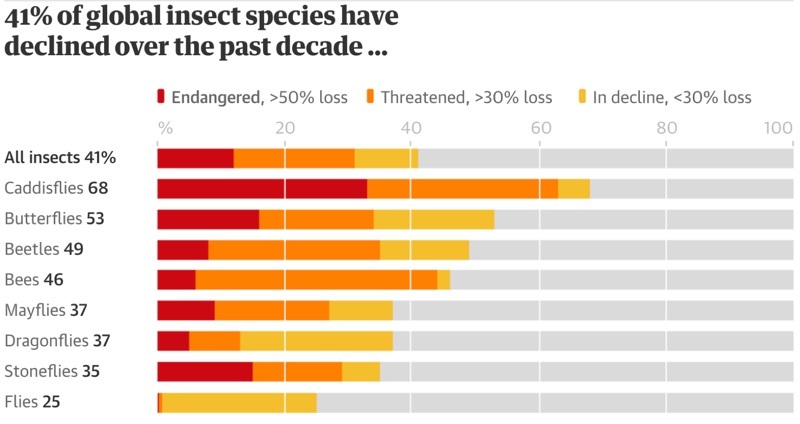 A landmark new study warns us that 40% of the world's insect species are declining and a third are endangered -- having a catastrophic effect on our planet’s ecosystems. The scientists don’t mince their words. This dramatic decline in insect numbers would be the largest extinction event on Earth for millions of years, as insects are a crucial food source for other wildlife and pollinate our plants. SumOfUs members like you are leading the fight against bee-killing pesticide corporations and intensive agriculture, that put their profits over the health of our bees and the planet. Just last year we won huge bans on Bayer and Syngenta’s toxic pesticides in Europe and Canada. But we can only do this with the incredible support of SumOfUs members like you who donate each month so that SumOfUs can keep challenging pesticide lobbyists, take the fight directly to their shareholders, and force our governments to pass bee-saving legislation. In light of this terrifying new report, can you chip in each month too to help save the bees at this critical moment in history? Half of all the bumblebee species found in Oklahoma in the US in 1949 had disappeared by 2013. And the number of honeybee colonies in the US has also been slashed in half. The report is clear that the world must change the way it produces food as industrial-scale, intensive agriculture is killing our ecosystems. And it’s only by fighting the pesticide industry, to protect our bees and other pollinators, that we can reverse this worrying decline. Can you chip in each month to take on the companies killing our bees? Right now we’re standing up to Bayer’s lobbyists in Europe who are trying to scupper plans to improve pesticide standards. Your donation will help us keep up this fight and others. Luckily SumOfUs members like you are experts at doing just that. Together we won a landmark ban on neonicotinoid pesticides across Europe, and we’ve gotten bee-killing pesticides taken off shelves from Australia to the USA. But we need to step up our efforts, and in more countries, if we’re to stop this catastrophic decline in time. We already have plans to push the EU to revolutionise pesticide testing standards, and ban even more bee-killing pesticides, and to take the fight to save the bees to individual American states, to overcome Trump’s disastrous environmental policy. Can you set up a monthly donation now, to help us achieve these goals in 2019?